Xenoblade Chronicles for Wii will finally get a limited American release in April 2012. Until today, Xenoblade Chronicles was part of an elite trio of JRPGs which have been denied American releases despite enjoying critical success in other parts of the Western world. 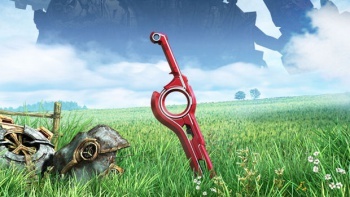 Now, after months of campaigning from vocal fan group Operation Rainfall, Nintendo has announced an April 2012 release for Xenoblade Chronicles. Developed by first-party Nintendo studio Monolith Soft, Xenoblade Chronicles was released in Japan in June 2010 and in Europe and Australia just over a year later. At the time, Nintendo of America (NAO) CEO Reggie Fils-Aime, prompted by the floods of emails, Tweets and letters sent his way by Operation Rainfall, wouldn't comment on the prospect of a US release beyond saying that NOA would pay close attention to the game's performance in Europe. The game will come with a $49.99 price tag and will only be available from GameStop locations and NOA's own website. While GameStop's website has the game listed for release on 2 April 2012, no official announcement regarding the launch date has yet been made. Given this success, many American JRPG-watchers will now be wondering if the chances of US releases for the remaining two games targeted by Operation Rainfall, namely The Last Story and Pandora's Tower, have improved at all. Operation Rainfall is still alive and campaigning; if you're inclined to do so, you can give it a hand on its Facebook page or by visiting its blog.